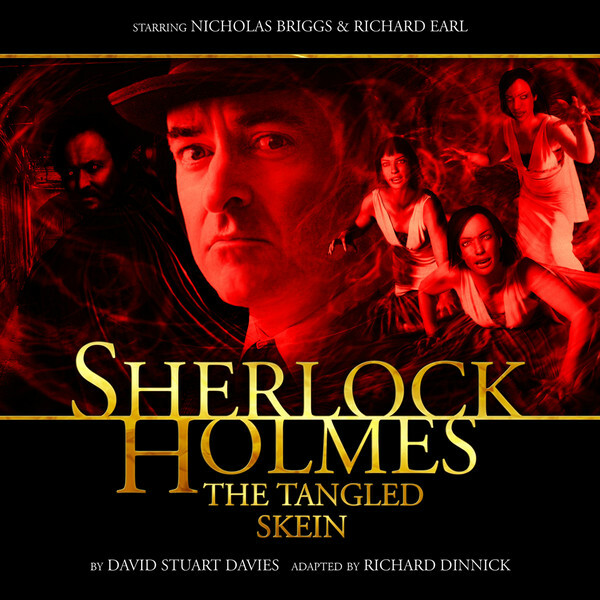 Big Finish: Sherlock Holmes - The Tangled Skein Review | Warped Factor - Words in the Key of Geek. The Tangled Skein is a direct sequel to The Hound of the Baskervilles. It takes the supernatural element of Hound and ramps it up to 11. No longer a fake ghostly hound for Holmes to contend with. Here we have Count Dracula himself! The result is an excellent story, although I do wonder if this is Sherlock Holmes seen through the filter of Doctor Who. As the play progressed I got a stronger and stronger impression of the Doctor and his companion roles being fulfilled by Holmes and Watson. Maybe it was the supernatural element (which in Doctor Who would, admittedly be explained by some scientific bafflegab, whereas here it is presented as straight up supernatural fact); or maybe it was how Holmes becomes the action hero, but this felt a bit like a gothic Doctor Who story – and that’s no bad thing. Initially skeptical, as he would be, Holmes quickly realises that vampirism is real and its trail leads him directly back to Baskerville Hall, the moor and the Grimpen Mire: the supposed scene of Stapleton’s death. I commented in my review of Hound that I found the denouement a bit of a disappointment, with Holmes never actually confronting Stapleton and his death scene happening ‘off-page’, as it were. It seems I am not alone in this, as David Stuart Davies, in his novel (from which this play is adapted) sees fit to give Stapleton and Holmes that confrontation AND a proper death scene – although a pretty unusual one. The scene between Stapleton and Holmes in the old house is great and played well by Briggs and Barnaby Edwards, returning as Stapleton. Edwards has dropped the genteel butterfly collector façade of Hound and is full-on crazy maniac out for revenge on Holmes for scuppering his plans of taking Baskerville Hall as his own. What is a little unsatisfying though is that, after this scene, Stapleton disappears until he emerges much later in the play, from a coffin as a fully-fledged vampire! It did feel a little as if the story had ticked the box of making Stapleton and Holmes meet but then wanted to get on with the business of vampires, only bringing Stapleton back as a bit of an afterthought. But still, it was a deliciously grisly end for Stapleton. Grisly is something which permeates this audio. There is a scene early in the play where Van Helsing begins to saw off the head of a vampire who has been killed. The sound effect used actually made my stomach turn and this is one aspect of the play which pushed it a little away from feeling like Doctor Who and more into a Hammer Horror film, which is clearly the other main influence on the story. There does seem to be a bit of box ticking on the ‘vampire film tropes’ list with pale-skinned young girls suffering from suspected anemia, to dwarf accolytes, silver bullets and Dracula himself crumbling to dust as the sun rises over the moor. But it is all enormous fun and extremely well-acted and directed that it really doesn’t matter that it feels a little like sometimes Holmes has just taken the place of Van Helsing in a Hammer Horror film. However, Holmes does get to do some deducing, mainly in working out that Dr Collins is actually working for Dracula. There are some neat little clues which feel very Conan Doyle-ish. I was less convinced by the link between Dracula and Baskerville Hall because it felt mainly like a way of linking Stapleton into a part of the plot he really had very little to do with. The cast are excellent with Briggs really cementing his portrayal of Holmes (not without a smattering of the good Doctor in there) being, as he is, centre stage for most of the story; unlike in Hound where he was absent for a sizeable chunk of the play. Richard Earl gives good Watson, again given a huge amount of narration, particularly in the chase of Dracula across the moor at the close of the story. Giles Watling is very good as Dracula and one of his accolytes, Dr Collins, whilst the rest of the characters are mainly performed by Big Finish stalwarts John Banks and Beth Chalmers. I remember the days of Big Finish when every other minor role seemed to be played by Helen Goldwyn, Nick Pegg, Barnaby Edwards or Jez Fielder, so I wonder, if one day, Banks and Chalmers with move on to other things. To be fair to them, each character is particularly distinct and, if I hadn’t known beforehand that they were playing so many of the supporting characters, that I probably wouldn’t have noticed (Chalmers voice possibly varies a little less from person to person, but it isn’t as clearly recognisable as it could be). The fact this story presents both Dracula and Van Helsing as ‘real people’ in the Sherlock Holmes’ universe is an interesting twist on what Doctor Who has recently done with the apparently legendary Robin Hood. Of course, if we take everything as canon (as I do), then with Sherlock Holmes and Doctor Watson appearing as real people in the New Adventure All-Consuming Fire, this means, in the Doctor Who universe, that Count Dracula and Van Helsing are also real people. We already know vampires are real, so is this such a stretch? Of course, on the other hand, the Doctor Who Christmas special The Snowmen implied that Sherlock Holmes was fictitious, but Deep Breath features Inspector Gregson who is a canonical Holmesian character. So who knows? I wonder if, as The Tangled Skein was not an ‘original canon’ story, they could have got away with less narration from Watson and more ‘full-cast’-ness; but as it fits better with the tone of Hound, I can see why they kept the balance they did. But this is a minor niggle, and this was a very enjoyable audio that I would highly recommend.